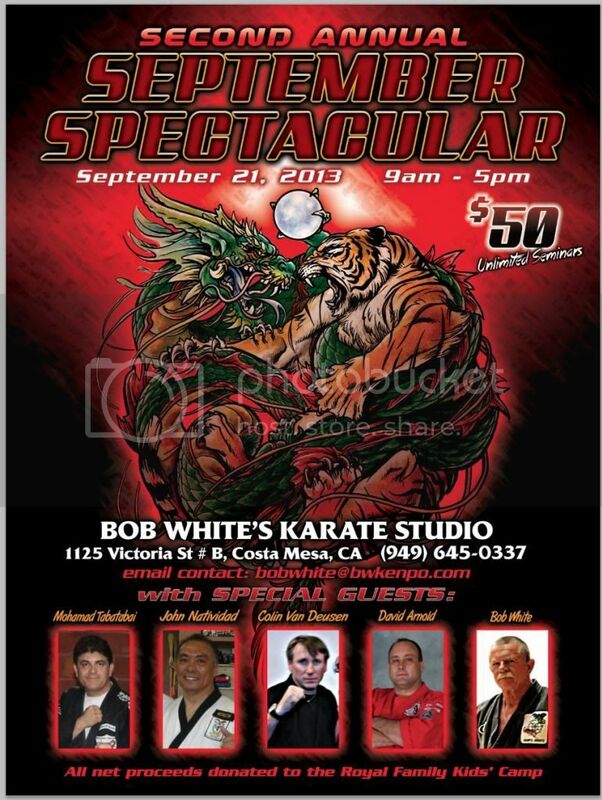 On Saturday September 21, 2013, Bob White's Karate Studio will proudly host our 2nd Annual September Spectacular Seminar. The day will consist of 5 seminars taught by some great instructors. The entry is only a $50 investment and participants can attend as many of the seminars as they want. All net proceeds from the seminars will be donated to the Royal Family Kids Camp. If you have any questions, please contact the studio. We look forward to a great day. That's one hell of a line up of instructors. Nobody should miss that one, not to mention Bob and John are living legends. Good cause as always. Wish I could be there. You know you are always welcome Doc. Plus, don't think I forgot about your offer to teach a seminar for the RFK. I'll be hitting you up soon! Hope that you are well and feeling better. Hope to see you soon. I'm not there, but I'm working on it sir. million people in seven countries. David Arnold - Dave Arnold holds Black Belts in both Kenpo and Jiu Jitsu. Mohamad Tabatabai – Mohamad Tabatabai is a 9th Degree Black Belt in Kenpo. Parker. Through his decades of intense study of American Kenpo, Mr.
will not know where one ends and the other begins. world-rated karate fighter before his retirement from competition in 1975.
to teach and give seminars. of the world's finest karate fighters. want. All net proceeds from the seminars will be donated to the Royal Family Kids Camp. Institute in Long Beach, CA in 1992 and has sustained a student base of over 600 members for over a decade. He is the former undefeated Head Coach of the world champion Los Angeles Stars in Chuck Norris's World Combat League, and has worked as a Peak Performance Coach for over a quarter million people in seven countries. you are taken to the ground. seamless application. The synergy between the two arts is so complete you will not know where one ends and the other begins. John Natvidad (aka "John the Giant Killer") - John Natividad was a world-rated karate fighter before his retirement from competition in 1975.
championship titles at the International Championships, the Colorado State Championships, Yamashita Open, Northern California Karate Championships and first places at the Las Vegas Nationals and the Black Belt Team Championships in Washington, D.C. John was a member of Chuck Norris' Championship team which fought throughout the United States and went undefeated for 7 years. He was also part of the United States Championship Karate Team, who won every team event they fought. John has practiced martial arts for more than 40 years both as a world-rated fighter and as a top notch instructor and continues to teach and give seminars. Bob White - Master Bob White has been contributing to the art of American Kenpo for over forty-years. On the tournament circuit he won numerous state, national, and international fighting championships. Bob White fought on the National All Star Black Belt Team, which went undefeated in 1973 and 1974. As a teacher and coach, he has consistently turned out some of the world's finest karate fighters. accounted for at least one of the Black Belt Grand Champions at the International Karate Championships. In the 1980s Bob White was promoted to 7th Degree Black Belt by Senior Grand Master, Ed Parker. This was the highest rank that Ed Parker ever promoted. He was one of only a very few to earn that rank. Master White has been inducted into many different Halls of Fame and recently he was the 2012 Keynote Speaker for the Masters Hall of Fame in Southern California. Just a reminder that the September Spectacular is this weekend at Bob Whites. It should be a great time and a chance to help raise money for the Royal Family Kids. We truly thank all who supported this event. The guest presenters did an outstanding job of educating and making the classes enjoyable. We would like to acknowledge the fact that their time was donated for Royal Family Kids and they were not financially compensated. Colin Van Deusen, John Natividad, Mohamad Tabatabai, and David Arnold are outstanding martial arts teachers but even better men. As a result of their efforts 5 children get to experience a week long camp that could make a positive change in their lives.